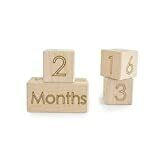 When it comes to wooden toys, especially the most popular alphabet blocks, there’s no doubt your baby or toddler is going to love to stack, learn, throw and chew on the blocks. But what’s occasionally lurking behind those seemingly innocent toys – is some extra chemicals we’re not aware of. Here’s the question: If this ends up in my kid’s mouth (because let’s be honest, everything does..), what exactly are they putting in their mouth? Are there any chemicals: formaldehyde, glues or adhesives, or any other toxins used to create this product? I’ve tried to buy educational and fun toys for my kids (preferably ones that don’t make a lot of noise – I’m thinking about you siren-wailing fire truck toy…. ), but with my second baby, I’ve started paying a little more attention to what goes in her mouth. There’s all these toys laying around that my 4-year-old won’t put in his mouth, but that my baby immediately thinks are chew toys. So I started researching, and I came upon some alarming facts. All those toys that are ‘Made in China’ and mass produced so they can be cheaper – some of them also come with dangerous chemicals. Last year while I worked for the CBS affiliate TV station in Utah – KUTV-TV, I came across a family-owned business that makes safe, non-toxic wooden toys that are surprisingly eco-friendly: Little Sapling Toys. And with baby #2 chomping on everything in my house, I decided to try out some of their wooden toys, including the ever popular alphabet blocks. First off, these toys aren’t made in China, they’re not even made in some random warehouse somewhere in the U.S. I saw their workshop in Utah – they’re hand-made – I saw one of the toys being produced with my own eyes. When I worked at KUTV, we even filmed the process – you can’t get a better guarantee than that. For those of you thinking of the everwoods and wondering whether it’s a good idea to buy wooden toys, don’t fret; Little Sapling Toys truly is eco-friendly. They help plant a tree for every toy they sell through a program called Trees for the Future. Just shy of 100,000 trees were planted when I started writing this. By the time you read it, it’s probably more. Check out the numbers here. So now that we’ve gone over the safety questions, let’s get down to quality and design. The first obvious different is size. The Little Saplings Toys alphabet blocks are noticeably bigger. The Melissa and Doug alphabet blocks have paint on 2 sides of each block. According to their website, it’s water-based paint so even if it chips off (or comes off when your enterprising baby thinks the blocks are a chew toy…), it should be safe. However, the Melissa and Doug toys are cheaper because they’re made in China, so I can’t help but question it. In comparison, the Little Saplings Toys blocks are made entirely from wood, and then finished off with local beeswax and organic jojoba oil. You can’t get more natural than that. To a baby, this doesn’t really matter, but when I really started comparing the 2 types of alphabet blocks, I noticed some key differences. The Melissa and Doug alphabet blocks have a few different letters and one number on each, along with an animal, food or other figure on one side – they’re all random – no rhyme or reason. But the Little Sapling Toys blocks have a lower and capital case letter on each side of the same block with either an animal or figure that represents the letter. In the picture as you can see Y is for Yoyo. In the letter D block, D is for Drum and for Duck. In the letter O block, O is for Octagon and for Orange. You’re going to teach your kids one way or another. But I like how this is a toy my baby is using to learn how to stack (and throw things at her brother), and how her brother can also use this toy to learn lower and capital cases of letters. Of course one is going to be more expensive than the other. The Melissa and Doug alphabet blocks average between $15-20 for a set, but it’s a set with paint that starts to peel and blocks that fit into my 15-month-old daughter’s mouth. She was kind enough to test this for me just yesterday. The Little Saplings Toys alphabet blocks cost around $50 for the set (also Made in the USA). But in comparison, you really do get what you pay for. This is a high quality eco-friendly non-toxic set of alphabet blocks. If you want the reassurance that you’re getting safe and baby & toddler friendly toy blocks for your little one to learn and grow with, get the Little Sapling Toys version. Both alphabet blocks will be fun for your child to play with, but only one of them truly stacks up (pun intended) and lasts the test of time.